This article explains paintball rules. The rules can be broken into two parts–safety rules and game rules. The safety rules are the most important paintball rules. While we take every player through a new player orientation and safety briefing, it’s a good idea to read through the safety rules before playing. Violations of the safety rules can result in a player being ejected from the facility without refund. All players must wear a mask approved for paintball while on the playing field. Your mask must remain in place between games. Lifting your mask away from your face, or removing the mask from your head is not allowed. The mask rule is one of the most important paintball rules. Paintballs travel at speeds up to 200 MPH and have enough energy to destroy an eye. Barrel covers are a device that’s placed over the barrel of the gun when players are not on the playing field. The device has an elastic cord used to secure the barrel cover to the gun. Barrel covers must be used at all times in the staging area and anywhere there are people who are not wearing paintball masks. If you lose your barrel cover, do not take your gun into the staging area. 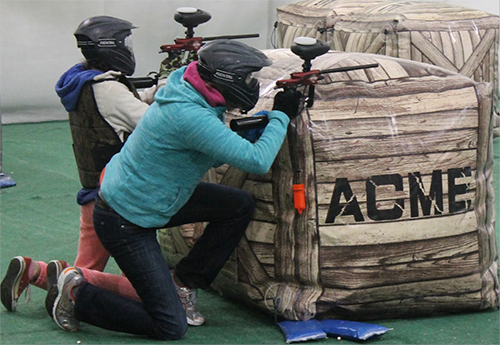 While there are many different game formats in paintball, there are a few basic paintball rules that you should know before playing. A player is considered eliminated when a paintball strikes the player and leaves a paint splatter on them or their equipment. The paint splatter must be the size of a quarter to be considered a hit. Spray from an indirect hit does not count. If a player gets within 20 feet of their opponent, they must offer a surrender. To offer your opponent a chance to surrender, simply point your gun at them and shout, “surrender”, or, “you’re out”. If you’re given an opportunity to surrender, simply raise your arms above your head and announce, “I’m out”. Do not point your gun at your opponent as they may shoot you.